Celebrate Chuseok (or more commonly known as Mid-Autumn Festival) with the new BBQ or HanJeongSik (한정식) menu at Korean restaurant HANSANG, where they put together prime ingredients for a luxurious meal with your family. In Korea, Chuseok is a major harvest festival where families gather for a meal with a table full of freshly harvested ingredients and definitely one of the two major festivals they celebrate (the other being seollal, or commonly known as Chinese New Year). 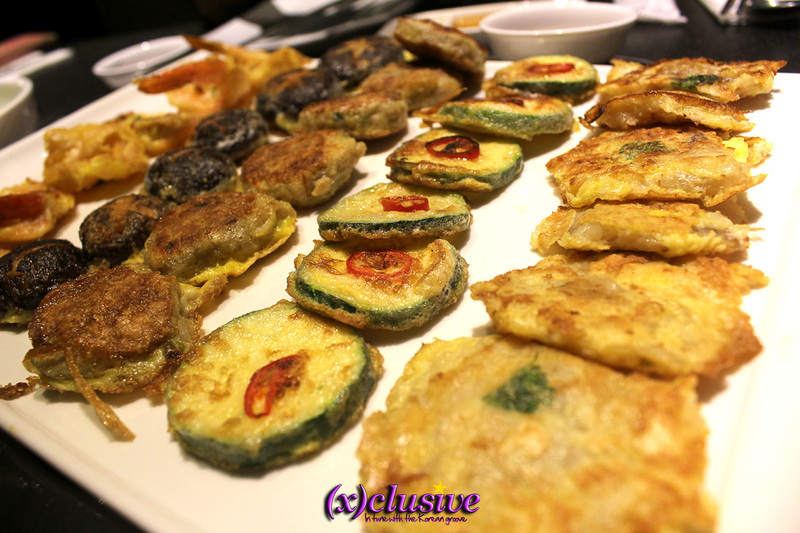 (x)clusive was invited to a media tasting a week back and was given the opportunity to taste the assorted pancake platter, BBQ Set and a part of the HanJeongSik Set. The assorted pancake platter – which comprises of mushroom, prawn, cod fish, minced meat and cucumber – was indeed a pleasant surprise. As it takes a lot of effort to prepare this dish, it is not commonly found in Korean restaurants in Singapore and will only be available at HANSANG this Chuseok. As such, do not miss this opportunity and get your hands on the assorted pancake platter should you head to HANSANG. The BBQ set comes with a total of five beef types (Wagyu Fillet, Wagyu Brisket, USDA Prime Ribeye, Marinated Beef Short Rib and LA Beef Ribs) and five pork selections (Pork Belly, Pork Loin, Pork Jowl, Pork Collar Meat and Marinated Pork Rib), grilled on their trademark Smokeless Charcoal Roaster – no more needless shifting in aim to avoid a smoke-in-your-face dining experience. While the Pork Belly ended up being on the dry side and the Pork Loin a tad too tough on our teeth, we definitely enjoyed the Wagyu Brisket and Pork Jowl for their tenderness. The marinated cuts too, filled the room with their sweet fragrance the moment it hits the grill, and the flavor certainly did not disappoint. Don’t forget to wrap the piece of meat with a piece of lettuce and the available condiments for a more refreshing taste. The BBQ Set is served with both the beef and pork platters, japchae (잡채), jeon (전), doenjang jjigae (된장찌개), side dishes, assorted vegetables for wrap and nurungji (누룽지). HanJeongSik (한정식), a traditional Korean course meal for those who prefer a variety, features Nurungji (누룽지), six main dishes including Beef Bulgogi (소고기), Pig’s Trotter Jokbal (족발) and Boiled Pork Belly Bossam (보쌈), two soups and ten assorted side dishes. The nurungji (누룽지) we tried was cooked with a mix of purple glutinous rice, sweet potato, carrot, pumpkin and barley. The rice is fragrant with a slightly sweet taste, and is definitely a great complement to the doenjang jjigae (된장찌개), which can be a tad too salty when eaten on its own. Nurungji (누룽지), more commonly known as scorched rice, is a traditional Korean food. After scooping out the rice, a thin crust of scorched rice will usually be left behind. Nurungji can be eaten in either its crisp state as a snack or as an after meal rice tea by adding hot water or re-boiled with water to make nureunbap (눌은밥) or nurungjibap (누룽지밥). It is believed that it could help in your digestion after a heavy meal. The two menus are currently being offered at $45++/pax (originally priced at $90++/pax) at The Grandstand outlet. Though no doubt still expensive, the quality of food offered is definitely worth the price. Bring your family to HANSANG and have a wonderful Chuseok meal with either the BBQ or HanJeongSik set. You definitely won’t be disappointed! A big thank you to HANSANG for extending the media invite. For more information, check out HANSANG’s official website or HANSANG’s official Facebook page. (x)clusive: 100422 Hi five with Jang Geun Suk!